[BUY SMART] CE ROHS\CE EMC\CE-LVD\UL 588 CERTIFIED. At Trusted outdoor indoor Led string lights, you'd enjoy a 18 MONTH WORRY-FREE PRODUCT GUARANTEE & CAREFREE CUSTOMER SERVICE by contact us at quntis_service@outlook.com. [SAFE TO USE] The LED curtain lights made of high-quality material, with high brightness. The LED Starry Light will not overheat after many hours of usage. 29V Voltage is safe to touch even for child. WATERPROOF(IP44) Perfect for indoor and outdoor decorations, but the controller and plug are not, you need to do some protection. [8 DIFFERENT MODES] This LED string Lights with the Combination, In waves, Sequential, Slo-Glo, Chasing/Flash, Slow fade, Twinkle/flash and Steady on. With memorable controller, will not change the lighting mode after unplug. [JUST PLUG AND PLAY] Flexible, portable and easy to store and set up. Just plug and play, with US standard voltage 29V, no need for battery. You can put the led starry lights away after using or move it to use in another place easily. 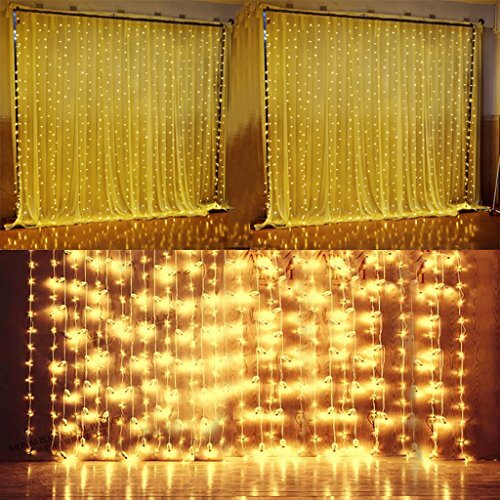 [6.6FT*9.8FT LED ICICLE STRING LIGHTS] Beautiful 6.6ft*9.8ft, 300 LEDs WARM WHITE led strip curtain light popularly used for decorative - party, wedding, home, kitchen, Garden, window, wall, bedroom, festival, Holiday, Christmas warm up, doors, floors, ceilings etc. If you have any questions about this product by Quntis, contact us by completing and submitting the form below. If you are looking for a specif part number, please include it with your message.